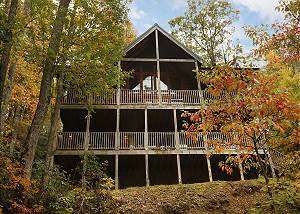 Location: Gatlinburg, TN (Two miles from Downtown Gatlinburg; 1 mile from Grocery Store/Restaurants. Suite Harmony offers 2 king suites making it great for a grown-ups getaway or the whole family! 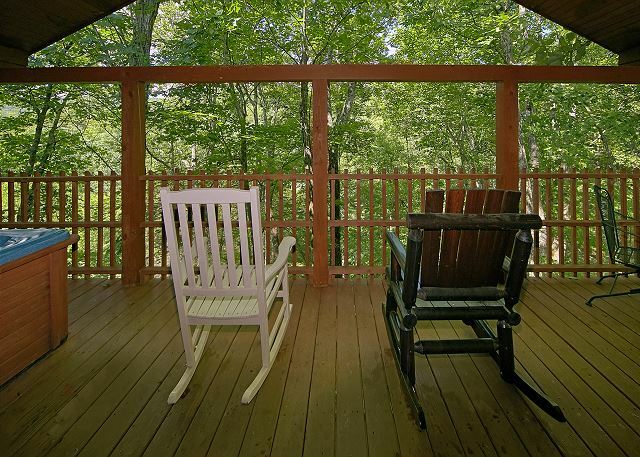 Located just minutes from downtown Gatlinburg. You'll appreciate all the space available to relax at this amazing mountain log cabin. 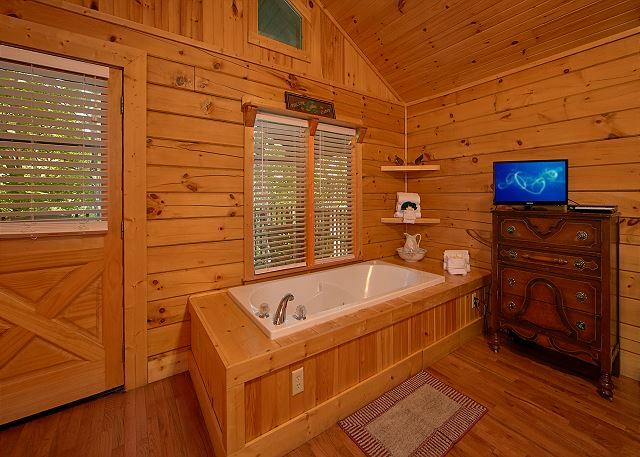 The log cabin has beautiful bar entertainment area with a large flat screen TV. So whether you are booking a vacation for fun, entertainment, or rest and Harmony is a fantastic pick! 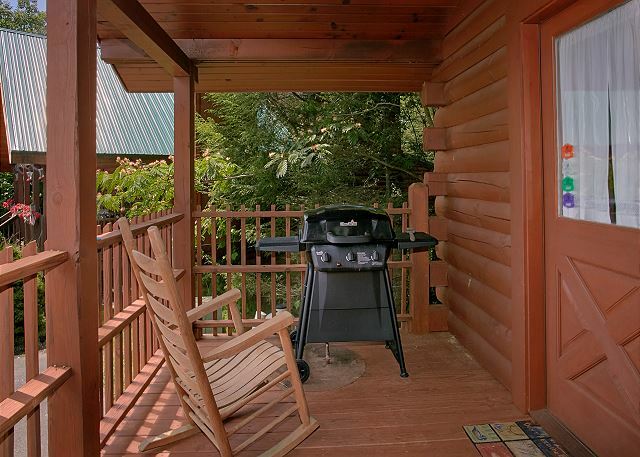 This beautiful two level Gatlinburg log cabin features free wireless internet access, long distance and a spectacular mountain view, which you can enjoy from the private hot tub on your deck! Rate is based on 4 adults, each additional adult is $12.50 per night. We had a great experience at the cabin. It is relatively close to downtown and is on the side of G'burg that is closest to Pigeon Forge. Both bedrooms were in fine shape and the common areas were good as well. Cabin has a beautiful interior. The living room was big enough to accommodate a roll away that was provided and an air mattress. As far as the pictures on the add, what you see is what you get. If you are looking for an amazing unobstructed view of the Smokey Mountains, you may be disappointed but the view was still beautiful from the cabin. The cabin was in great shape when we arrived. I was super happy when Aunt Bug's told me that I did not have to stop at the main office in Pigeon Forge since I had all of the required paperwork complete. Our stay was great. We loved our cabin and plan on returning with the rest of the family. We had an awesome time. This was our 1st time ever staying in a cabin and visiting the area. The staff was great and very helpful in giving us information on where to go and how to find it.The cabin was clean and the room layout was great. My wife and 2 children had a fantastic time and will definetly be back! We rented Suite Harmony for a weekend girls getaway, and we couldn't have been happier with the property. Two master suites (with jetted tubs) and a hot tub on the deck. Who would want to leave? Everything was super clean, the beds were great, fully functional kitchen and laundry. I wish we could've stayed the week! We loved our stay with Aunt Bugs in our Suite Harmony #243 Cabin. So much to do with the family in Gatlinburg and surrounding area. The view from this cabin is amazing! 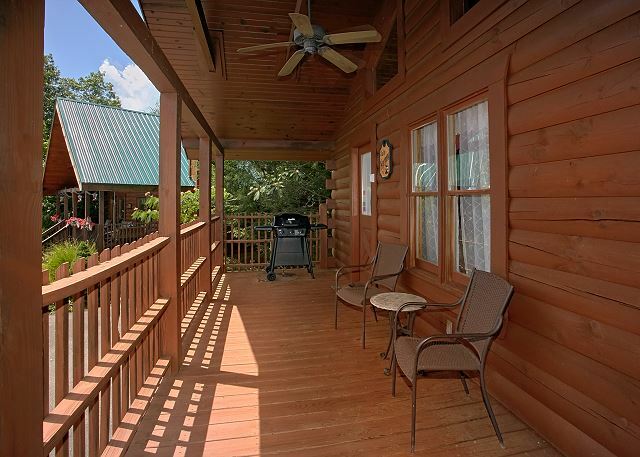 This cabin is wonderful for a family and has everything you needed!!!! We loved the layout and the upstairs deck has a hot tub!!!! The basement is amazing with a bar area, that's too cute!!!! Your doggies are welcome in this particular cabin! Just keep in mind, check in is at Sevierville, Tn. We almost waited too late to get to the home office to check in and then get back to the cabin. 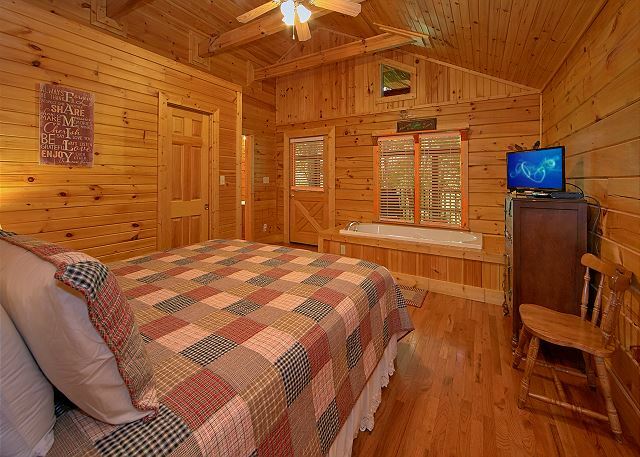 This cabin is located perfectly right outside of Gatlinburg. You can not go wrong with this one!!!! Such a wonderful experience and definitely coming back! So clean, had everything you needed and more! Great location close to everything. Beautiful views! We fell in love with this cabin and already talking about booking again soon. Hot tube very clean, great deck that is private. Wonderful for family getaway or couples with the up stairs and down stairs bedrooms! We love this place and can’t say enough great things about it! We loved our cabin and enjoyed our stay! However I stayed in the room downstairs and it was freezing! It didn’t matter how high we turned the heat up it didn’t circulate downstairs we’ll and there is no fireplace downstairs to help. I would suggest puttin a space heater down there. 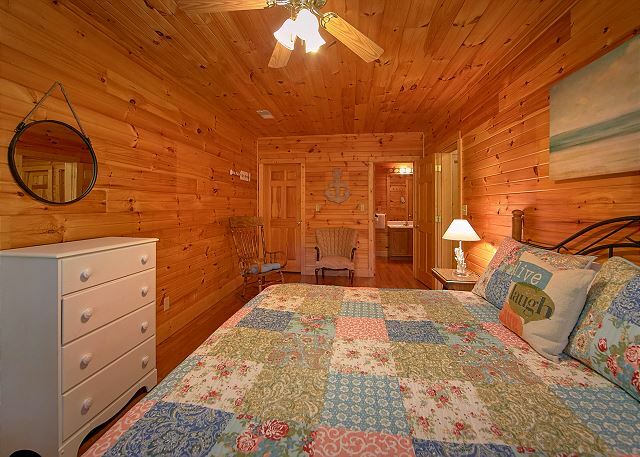 This cabin is in a great location, easy to find, and has everything you need for a cozy & relaxing getaway! The hot tub and the jacuzzi tubs in the rooms were amazing! The beds were super comfy and the kitchen had everything to make meals and our Superbowl party fiesta. Thanks, Aunt Bug!! The cabin was very clean and so close to Gatlinburg. We stayed with another couple and loved that we each had our own bathroom connected to our room. The shower was really tiny but did the job. And of course we loved the hot tub. We had a great stay and would definitely stay again and recommend. While the cabin is small, it was very clean and comfortable for 2 couples and 2 small dogs. Being only 5 minutes from downtown Gatlinburg was great. No view from the back deck where the hot tub is, but a pretty view from the front porch. The walls are thin and we could hear all movement throughout the cabin and having to walk through one of the bedrooms to get to the hot tub was a bit awkward. But, we had a great time and would definitely stay here again. Good time. Location is close to Gattlinburg,very nice. Look forward to next year. ANGEL WAS AN ANGEL! We got our previous reservation canceled due to maintenance issues and she took care of us! The stay was awesome! The cabin was just as described. Very clean. Beautiful view. Wonderful experience! Nice and easy access, with neighbors but at the same time extremely private! accommodations and service great; thank you for everything. I would recommend Aunt Bug Cabin Rentals to anyone. Cabin was initially hard to find.... need to follow directions carefully and in daylight.... cabin back deck was excellent with nature and great space. Lights and ceiling fans were very DUSTY...kitchen was not very clean, no baking dishes at all. Jetted tubs in bedrooms were very nice as well as hot tub on back deck. Location was good, very quiet and relaxing. We had a great time but cabin could have just been cleaner. Decorative flowers were dusty and dated, get rid of decorations would be better than ones that look dirty. The cabin was great. Everything we were promised. My parents and I recently enjoyed an enjoyable stay in Gatlinburg. Carol at the rental center was extremely helpful and the gentleman that checked us in was also accommodating. The main complaint regarding this particular cabin was that the lower level master suite did not have a separate temperature control and it was extremely cold in the lower level. Other than that, it was lovely, great location, cozy and close to everything. Our family had a great time staying at this cabin. Even though there were several cabins next to ours, the balconies overlooking the cliffs were completely private. It's a very nice design. Our family of 4 had a very relaxing stay at Suite Harmony. The tvs, pillows/mattresses and bedding are due for a refresh. The cabin was in good working order. All the downstairs vents had been closed which made the first night chilly in the lower level. After opening the vents, the cabin stayed a comfy temp. The cabin is very close to downtown Gatlinburg. The hot tub and foosball table were great, enjoyed by the kids. Kitchen had all the basic amenities, frig, stove, microwave, blender, toaster, pots/pans and utensils. Ice maker was speedy, good for the daily cooler pack. The cabin also has wi-fi. The driveway is very manageable. The cabin is located on a court with several other cabins, but angled to provide privacy on the deck/hot tub area. Very peaceful setting. Check in with Aunt Bug's was a breeze. The pet friendly cabin was spacious, modern, clean, and convenient. The Aunt Bug's app kept us in the know, and it made check out simple. We are repeat repeat Aunt Bug's guests, and we've yet to be anything but absolutely satisfied! We had an amazing time at Suite Harmony. I've always loved Gatlinburg and this time I invited my cousin, her husband, and my brother to come along. Our little family trip could not have gone any better, the cabin was fantastic. My cousins drove all the way from Massachusetts and they just can't wait to come back. The location could not be found via GPS but the directions they gave us at the rental office worked out just fine. We had a supermarket right down the street and we sure used it. We cooked and bbq'ed every night, and played around town every day. I have no complaints, the only thing I'd change is I would have booked a couple extra nights! Aunt Bugs Cabin rentals. Cabin was very well maintained although there were a couple minor issues. The kitchen sink faucet was leaking and I forgot to tell the maintenance staff about it before we left. The other issue was a light bulb burned out in the upstairs bedroom. These issues I consider very minor as we enjoyed our stay again at one of Aunt Bugs Cabins. Very friendly staff and helpful but definitely need to sweep and clean the spider webs inside the cabin. Suite harmony needs additional blinds in the front room side window. Otherwise always a great stay! Excellent loved the country feeling in the cabin. Decorating was great !! The cabin was very nice and clean. Good location, good view, had all the amenities including all kitchen utensils and crockery. The only thing I would change is the bed in the basement which was very noisy and even turning in bed would make a lot of noise. We loved our stay and will definitely be back ! Suite Harmony 243 is the perfect location. Easy to get to downtown but still secluded. We loved the new furniture. The cabin was amazing and so was the customer service. Everything was excellent. I will be buying a cabin soon and I will consider allowing you to manage it for me. We wasn't able to check in before the offic closed they called to check on me that was nice. Helped me get things set up for late check in. When we got ready to check out we was running about 10 minutes behind they said it was fine. Every one was so nice. I will definitely rent from Aunt Bug's next time. called me to prepare me for late check-in when I wasn't even aware of how late it was. The stay was wonderful. The cabin was clean comfortable and beautiful. Thanks so much!!! I have to be honest. We stayed at an Aunt Bugs cabin last year and we were terribly disappointed not only with the cabin, but with the staff's total disregard for our complaints. This year, I inadvertently booked through Aunt Bug's again. But, Aunt Bugs is redeemed. We loved our canin!! It was perfect!! Our only negative comment, and it's really just an FYI fir Aunt Bugs; the gas gril should be cleaned of build up for your guests. We nearly had a bad accident 3 minutes into grilling 😊We will definitely book this cabin again. The pictures do not do it justice. The cabin was clean and exactly as described online. The staff was helpful and check in was a breeze. We had a great time! My family and I enjoyed staying at the cabin. The staff was very helpful and kind. The cabin was beautiful and very spacious. We especially loved the jacuzzi hot tub. We would definitely stay here again. The cabin was exactly as described. Had a great time. Renting from Aunt Bugs was a lot nicer than a hotel with kids and a pet. This is a great cabin with a perfect location! Love the new bar and entertaining area. Great. Cabin was very nice and clean. We loved our stay and would recommend Aunt Bugs. Reservation making was easy, staff was helpful when a change of cabin reservation had to be made. Directions to cabin was more than adequate. Cabin was clean and welcoming. Supplies such as cooking utensils could have been more plentiful. Beds were so noisy. Beautiful cabin. Great location. Could not ask for better accommodations for the price. Cabin was very nice. Had just a little issue with water jets having black coming out of both tubs. Most places we have stayed did not have those kind of tubs. Very nice to have them. We enjoyed our stay and liked the location. Spacious, clean, and convenient! Our third time staying with Aunt Bug's, and it won't be our last! Easy check in and the Aunt Bug's app was especially useful! The experience was great and I will use you services in the future. We had a great time. The cabin was clean, comfortable, easy to find. We all had a ball.